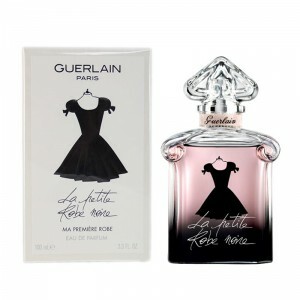 Guerlain La Petite Robe Noire Ma Premiere Robe for beautiful women. Guerlain La Petite Robe Noire Ma Premiere Robe 100ml. Eau De Parfum - French legendary brand Guerlain in the spring of 2016 released a limited edition of its famous flavor of the La The Petite Robe's Noire. The name received the prefix Ma Premiere Robe 2016 and presented in an updated design - recognizable bottle decorated with colorful flourishes and black silhouette girl in a hat. Colorful brushstrokes, as if left by the artist's brush made in the colors of the new lipstick from of Guerlain, which will be available in the spring of 2016. As for the composition of this fashionable, flirty perfume, it has remained virtually unchanged and corresponds to the composition of music classic La Petite Robe Noire in Eau de Parfum concentration. Thierry Vasseur reinterpreted composition La Petite Robe Noire and created a fruity-floral fragrance called La Petite Robe Noire the Premiere of Ma Robe's. Our new little black dress now acquires a slightly different "cut" - now it is not just a classic dress, and the first evening dress for the premiere of the promenade along the red carpet. Perfume flavor added "the most beautiful black perfume notes," making it more saturated, persistent, deep and "thick" like divine nectar. La Petite Robe Noire Ma Premiere Robe notes of almond, combined with a spectacular black cherries, red berries and bergamot. The heart of the fragrance principal violin belongs to a black rose and tonka beans, which are the basis of smoothly render us on the plateau of the fragrant notes of almond and black tea.